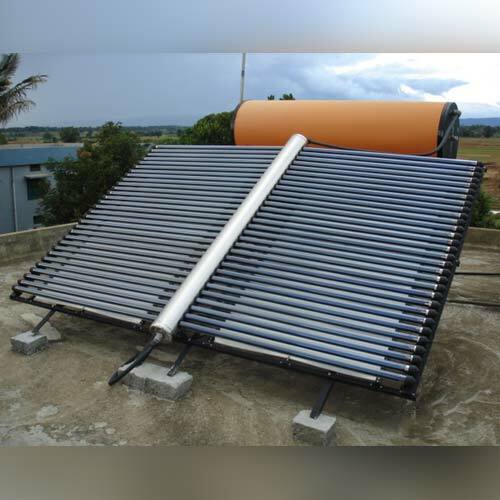 Solar Water Heater is a device which provides hot water for bathing, washing, cleaning, etc. using solar energy. It is generally installed at the terrace or where sunlight is available and heats water during day time which is stored in an insulated storage tank for use when required including mornings. Solar Water Heater comprises of a or an array of solar collectors to collect solar energy and an insulated tank to store hot water. Both are connected to each other. During the day time, water in solar collectors gets heated which is either pumped or flown automatically on thermosyphon principle to the storage tank. Hot water then stored in the tank can be used for various applications. Sungrace offers the widest range of solar water heating systems for both domestic and industrial applications.